Having a portable light source is always handy, whether it be for work or at home use. 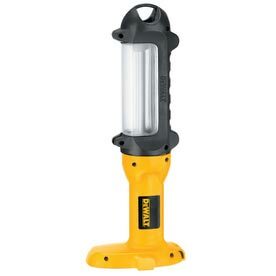 So for anyone in the market for some light on the go, you might want to check out the DeWalt DC527 that Lowe's has on sale for only $25. The DC527 is a 13-watt fluorescent light that has a built-in telescoping and 360° rotating hook which allows the unit to hang from 2" materials and other locations. Normal retail price for this light is between $40-$45. Of course, battery and charger are not included. Sale ends 3/31/2011.